1. 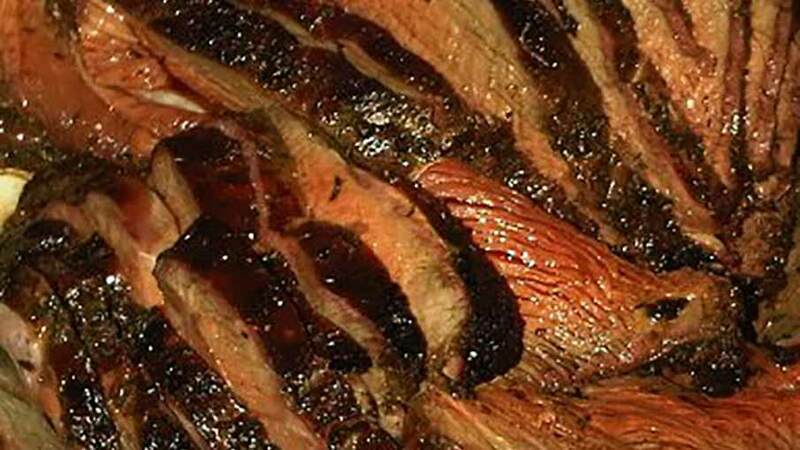 Place roast on a large sheet of heavy-duty aluminum foil. Spread butter or margarine over top and sides of meat. 2. To make the stuffing, combine breadcrumbs, salt, pepper, onion, sage, thyme, celery, parsley flakes, basil, apples and bouillon in a large bowl. Mix well. 3. Pat stuffing on top of meat with fingers. Arrange bacon slices on top of stuffing. 4. Fold foil around roast, leaving some air inside but sealing all seams with a double fold. 5. Roast in a 350 degrees oven for 2.5-3.5 hours or until tender and well done. 6. Slice meat and serve accompanied by stuffing. Recipe courtesy of Jim Zumbo's Amazing Venison Recipes cookbook.